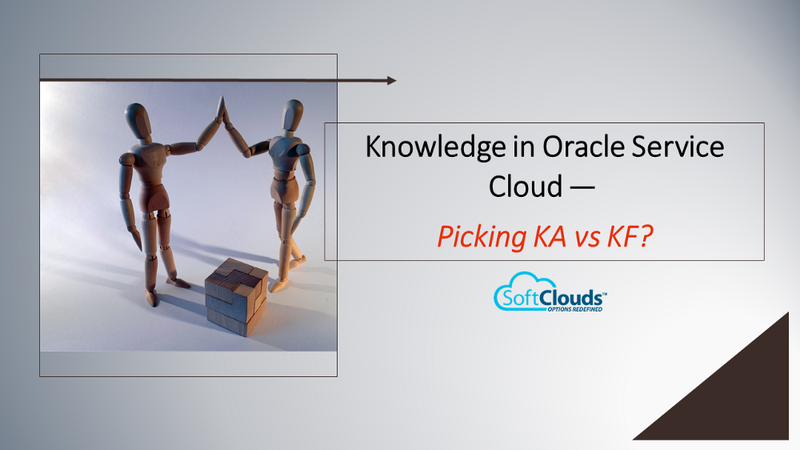 Knowledge in Oracle Service Cloud — Picking KA vs KF? K nowledge Management plays a critical role in the success of a Customer Relationship Management (CRM) implementation, and for good reasons. The function of a good CRM system is to deliver solutions to customers regarding issues they are experiencing. When an agent engages a customer, they need to have the answers they need in real time. Experienced agents may be able to get through certain customer engagements based on their past encounters with recurring problems, but that is not a typical case at a customer care center, and it is not a method on which a customer support organization ought to rely. What customer care centers need instead is a mechanism that makes knowledge available to agents and effectively returns the relevant information at the point of contact between the agent and the customer. This is where an effective Knowledge Management System (KMS) comes into play. Ideally, a well-designed KM system integrated into the agent's CRM system would deliver what the agent needs when they need it in real time and easily. For this reason, the ability handle Knowledge Management is a crucial differentiator in the marketplace for a better customer experience. Oracle Service Cloud (OSvC) presents two choices for Knowledge Management: Knowledge Foundation (KF) and Knowledge Advanced (KA). This article focuses on the properties and capabilities of these two KM solutions — KA & KF, and provides a comparison that should help as a starting point for organizations adopting OSvC and considering their options. Knowledge Foundation (KF) is the solution that RightNow brought to Oracle when it was acquired and renamed Oracle Service Cloud (OSvC). 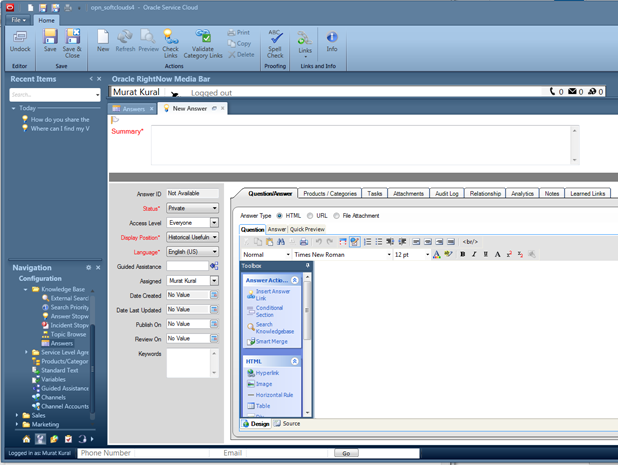 KF provides a pre-defined template for documents structured in three major blocks: title, description, and answer. Title and Answer are the header and the body for the content, and description corresponds to the snipped returned with the title when the content matches the search. Categories and products are made available for documents, called Answers, created in KF. From a content management perspective, KF also provides the ability to mark sections within the body of the text (in the "Answer" field) for a particular user type. This allows users to enter comments in the body of the article that are only intended for the agents. 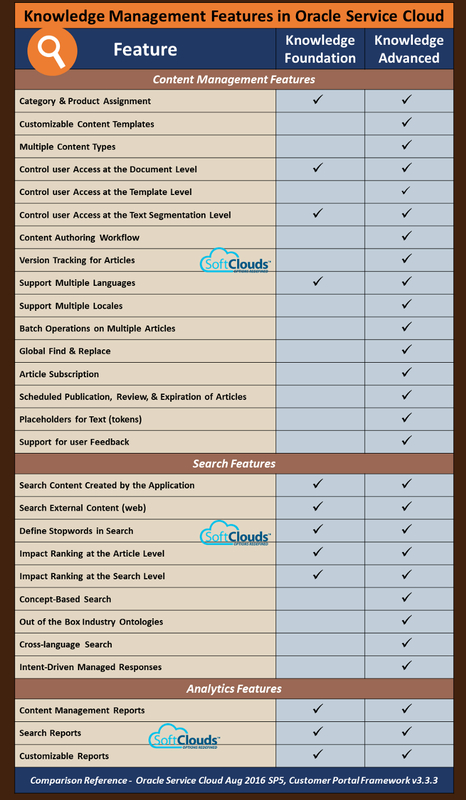 The content is served to agents through search. On this front, KM mostly brings an automatic ranking algorithm that learns from the user's behavior with respect to the way they click on articles returned as search results. Additional knobs provided in the application helps a given article return higher (or lower as the case may be). It also has a way to construct a list of words that give priority to documents that contain them. Beyond those, however, the search behavior in KM is more or less opaque with only a very superficial way to tune results. Knowledge Advanced (KA) is a new solution that is added as an alternative to KF in OSvC. It is, at its core, a hybrid of KF and another Oracle acquisition, InQuira, an on premise KM system. KA combines parts of OKM and KF in a cloud-conscious package. It strips away some of the complexity and power of OKM, and combines its remaining core (mostly the content management part) adding in selected features that KF provides, most prominently, the ability to determine how a given article should be ranked in search results and the ability to assign different levels of security to pieces of text inside the content, neither of which are featured in OKM. The ability to create multiple content types and templates with custom fields and attributes. The ability to create content publication workflows and assign each content type its own workflow, if needed. 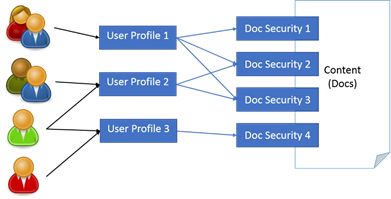 The ability to define different content authoring roles to specify what content types a given console user can work with and what they can do with the content — create, edit, review, or publish. A versioning system that retains older versions of an article. A mechanism to connect a source document and its translations to be able to treat them as the same document. The ability for end users of the content to be able to provide feedback to individual articles, which closes the loop with the authoring staff. Concept based search matching and a basic NLP engine that also allows cross-linguistic matches between the user's queries and the content. KA clearly takes the KM capabilities of OSvC to its next level and provides a more sophisticated and potent alternative. This brings us to the next logical question: when should one opt for KF, and when for KA? 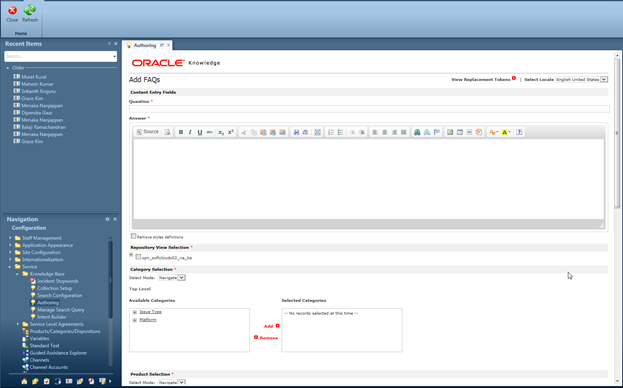 Since both solutions come with Oracle Service Cloud, features provided by OSvC itself are obviously not the differentiators: Guided Assistance, for instance, which provides agents stepwise guidance through a process by taking them down a decision tree, is available to both KF and KA; or chat and other channels that is made available to agents. Neither are the features shared by both KF and KA, such as the ability to crawl external (web) content, the use of stop words, the security model, or any other mentioned above. The decision to stay with KF or go with KA will come from the areas in which KA provides the features that are not available in KF, which has mostly a subset of KA's capabilities. Agents often need to have access to different types of documents when they are handling cases. Solutions, designed to solve problems, manuals and other types of documentation to identify properties and specs of a particular product, "how to" documents to spell out the steps for how to do specific things, i.e., how to register a device, file a form, apply for loans, so on. Once the organization decides to deliver the content to their users through a web self-support site, which is a crucial component of an effective support organization, additional content types would be needed, such as FAQs. Different types of content typically require different types of structure: All that is needed for an FAQ document is the question and its answer. For a solutions article, the industry standard would be to define the problem, its cause, the environment it appears in, and its solution as sections in a well-structured solutions article. For documents that are visible to the public, there may be a need to create an entire field intended for internal use. So the broader the organization gets with respect to constructing the right types of content, the more likely they are to need different templates that KF is not able to provide. Having a workflow attached to the publication of Solutions, FAQs, How to and other types of articles, allows a review process that is in line with the organization's needs. It may be the case, for instance, that certain types of articles, those that have to do with policy, need an additional legal review step. Or instructions that involve potentially dangerous steps may require the extra scrutiny that a second reviewer may provide. All these considerations should direct the organization towards KA since these types of capabilities are not available in KF. In certain contexts, there are serious legal implications to what is included in support documents. Whether there is a product recall or a dispute with a customer regarding a plan, it may be important to know what exactly was included in the document during the slice of time that is relevant to the case. In situations like that it is in the vital interest of the organization to be able to track the content not just as it appears now, but as it may have appeared 6 months ago, 3 years ago, and so on. That is where document versioning may play a key role in Knowledge Management. Another instance where versions matter is if it turns out that revisions made to a document need to be rolled back because a problem has been discovered in the content. In this type of scenario, KA not only keeps track of previous versions, it also gives the console users the ability to roll the document back to any previous versions as needed. If it turns out the versions need to be compared side by side, KA has that capability as well. So if an organization's business would benefit greatly from this capability, again, KA becomes the clear choice. KF allows for content to be created in different languages as well, but KA takes that to the next level. It not only allows other languages, it also allows other locales. A locale is defined as a combination of language and country (roughly). This means it is possible in KA to set up an English US locale distinct from English UK or English Australia as well. The same applies to Spanish Spain vs Spanish Mexico, vs Spanish Argentina, and so on. The ability to take an English US article and "translate" it not only to Spanish Mexico, an obvious choice, but, say, English Canada, allows the organization to tailor articles to their intended country as well. It would be a simple task from this perspective to replace all references to the American Automobile Association and replace it with Canadian Automobile Association for the "same" document for Canadian audiences. As a side note, KA also provides place holders called "tokens" to have locale specific values, so that console users can create a token for "Automobile Association" and spell it out as AAA in the US based documents and CAA in Canadian based documents. All this suggests that KA comes to the globalization context with some tricks up its sleeve that users can take advantage of. KA introduces three ways for customers to provide their feedback regarding the content: article rating, threaded discussion inside the article, and content recommendation. Each of these elicit slightly different types of feedback. While ratings provide an absolute metric for quality, threaded discussions expand the range of feedback and allows users to interact with one another, as well as providing feedback. Recommendations are how customers can pass their requests to the business directly, whether it is in the form of a request for new content, or commentary on an existing article. This is a highly desirable feature that allows KM providers with valuable user input, an opportunity to improve on existing content and be able to provide better service by providing better content to agents or users on web self-support sites. As mentioned earlier, search is typically how the content is delivered to the end user, who in most cases would be interacting with the KM system without the foresight of knowing what particular article they need to see in order to resolve an issue. The task of mapping the customer's problem to its solution is mediated by search. A robust KM system should by definition have a sophisticated search capability to serve as the bridge between the user and the knowledge. Natural Language Processing (NLP) flavored search engines come with the capacity to respond to user's queries without having to require that the question be asked in a certain way to be able to match the intended article. They have built-in mechanisms that allow the user the latitude to ask their questions in a way that they would normally do in real life, speaking to a real person (in more concise terms, obviously; verbosity may not be the best strategy in search whether it is driven by NLP or it is a pure keyword or Boolean match) and retrieve the desired content. KA does this through the concept based search system that it inherited from Oracle's on premise solution, OKM. Between its fairly rich out of the box ontology and the ability of the user to add custom concepts as needed, each search action is then mapped to a set of additional terms (words and phrases) that are determined as synonyms for the terms the speaker used in a query. For example, if the user asks for "fuel efficiency", the dictionary internal to KA has the ability to match to "high mpg", which increases the chances for search to be successful and deliver the correct piece of content to the user. Because KA is designed to work with many locales, the ability to search on concepts also allows users to ask their questions in one language, and if desired, return results in another language. This may not appear to be a big advantage to most monolingual readers, but for the polyglots of the world, and especially in the parts of the world where nations tend to do their business in multiple languages, this is clearly a significant draw that expands the range of available answers to issues your global customers may be facing. KA was incorporated into Oracle Service Cloud because customers wanted to see a stronger Knowledge Management solution embedded in their Service application. That does not automatically mean that as a prospective OSvC customer you need to take the KA option. Even though it has some very clear advantages over KF, the determination should ultimately be made by the KM needs of the organization. For organizations that do not need multiple content types, or a workflow and a division of labor between console users in content creation, or are not in the process of globalizing their applications, KF would handle their KM needs adequately. Once the need for a more sophisticated solution becomes apparent, KA would have to be considered as the correct choice. Knowledge Management is getting to primetime now — as knowledge is starting to drive the customer experience of the future. The KM solutions of the future will start to break down the silos of knowledge today and enable personalized & proactive customer experiences. This will be achieved by enabling data mining, real-time analytics & insights, ease of access and discoverability of knowledge with contextual relevance. Is your organization using Oracle Service Cloud — and if so — are you using Knowledge Advanced or Knowledge Foundation? What do you see as the advantage of KA or KF for your implementation?